we still banded several more, including this after-hatch-year male. Notes: The pace of banding settled down compared to the first week of winter, while the number of repeats increased substantially, reflecting birds settling in for the winter. We still banded another 143 birds during four banding sessions spread across three weeks. This brings our total for November to 377 individuals, already more than we've ever banded in an entire winter. Owling continued until November 13, but the migration was clearly tapering off toward the end. The final totals for the season were 122 Northern Saw-whet Owls banded, plus 2 foreign recaptures, plus 2 Eastern Screech-Owls, the second of which was the only bird banded on the final night of the season. Click here for a summary of the 2010 owling season. Juncos and goldfinches remained in the top two spots this week by a wide margin over all other species banded, although numbers of both were down compared to the first week of November. On the other hand, the chickadees rebounded to third place, after only six were banded in the first week of winter. House Finch and the three sparrows rounding out the list were also down in numbers a bit, though the number of White-throated Sparrows was quite impressive for this late in fall. 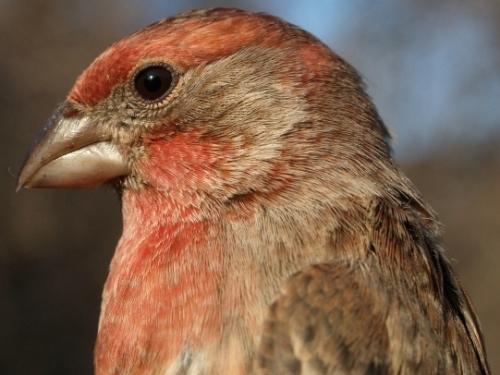 An additional five species tied for eighth place, with one bird banded each. The distribution of repeats during this period was also interesting, with 20 juncos and 20 chickadees suggesting that those two species are settling in as regulars at our feeders, compared to just 2 goldfinches (despite 93 being banded over the course of the month). We did, however, have one goldfinch return from a previous winter, as well as three chickadees and a Blue Jay. Among species observed, Canada Goose continued to dominate by an enormous margin, thanks to large flocks flying overhead most days. Crows remained in second place, while Mallard jumped to third, followed by the core species at the feeders: House Finch, Slate-colored Junco, Black-capped Chickadee, and American Goldfinch. Overall the list is quite typical for November at MBO. We have now banded 8059 birds this year, by far a record for MBO, and a total we might not be able to match again for years to come; factoring in repeats and returns, we had nearly 9500 captures in 2010. 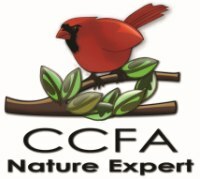 We will take a break from banding in December, allowing us time to review our data from the year and submit our annual report to the Canadian Bird Banding Office. Weather permitting, we will resume banding later in winter. In the meantime, we will continue with periodic visits to observe the wintering birds, and will post monthly updates on our observations. 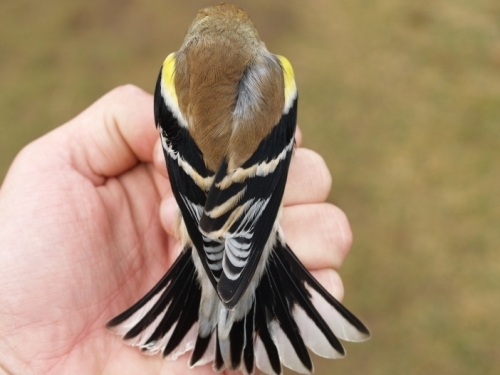 A top view of an after-hatch-year male American Goldfinch, with the tail nicely fanned to show the broad and rounded rectrices with large white patches, and distinctly yellow shoulders also clearly visible.